When should you wear a tie and when shouldn't you? In business a necktie is a must. 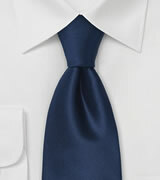 But also in your free time there will be occasions where a tie might be required. This includes first of all family parties such as weddings, baptisms, birthdays or anniversaries. Whenever this takes place on a grand scale, a tie is appropriate. Not only to underline the festive character of the occasion but also to show respect towards the host/ess and the effort s/he had made. 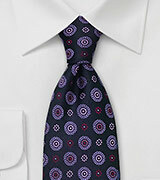 A sad occasion, such as a funeral, requires a black tie or a fine, dark pattern that appears from far as dark gray. Other occasions a tie would be appropriate: invitations for extravagant dinner parties at strangers or acquaintances, visit to a fancy restaurant, bar or cigar club, as well as an evening at the theater or the opera. Other reasons would be business-like occasions such as a talk at the bank about a loan, when buying a car, or when having an appointment at the lawyer or notary. Mens Ties signal competency, sovereignty, and even creditworthiness, and thus are worthwhile to wear for certain occasions. 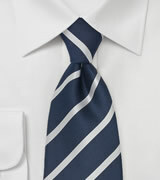 If the tie is required for a date, it depends on where it takes place. If you plan a romantic candlelight dinner, it would definitely be the cherry on the top! But which tie for which occasion? The selection seems to be innumerable at first sight. But when looking closer, one finds basic patterns, into which each design can be fitted without difficulty. Each of these basic patterns has a certain meaning to it, the same as every color has a fashion statement. Whoever keeps this in mind, can make the necktie a trademark of his own personality. What about the dress code for these ties? Good weekend-look: Yes, in country-like combinations with green, claret, brown or yellow. Office: Yes. Best would be on dark blue or claret background. Fancy dinner: yes, also in bright colors. Festivity during the day: Yes, but more subtle background. Good weekend-look: Yes, best with green or brown background. Office: Yes. E.g. dark blue or black with white spots. Fancy dinner: yes, depending on the season also with a lighter background color. Festivity during the day: Yes, but only fine dots on dark background. This necktie is considered typically British, but the Paisley pattern actually originated in the orient, The wild swirling fertility symbols have the best effect on powdery-matt silk. For business purposes, these patterns are only suitable in subtle shades and business-like colors such as claret or dark blue. Office: Only in quiet designs. Fancy dinner: Yes, also with strong red and yellow shades. Festivity during the day: Yes, but only in moderate colors. 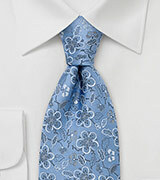 Good weekend-look: Yes, because this is the actual domain for this type of tie. Some are so artfully woven that they seem to be three-dimensional, others seem to flicker vertiginously. Such deluding effects makes geometrical ties an eye-catcher, but one should not expect one’s associate at a business lunch to be too hypnotic. Most stylish are those patterns that appear unobtrusive on first sight and reveal their finesse only when having a closer look . Office: Yes, but only with moderate patterns. Fancy dinner: Yes, but only also unobtrusive variants that will not distract the associate. Festivity during the day: Yes, e.g. with silvery background. They vary from the Hawaiian tie with palm tree over to the sunset popular in the forties to the souvenir brought from the Louvre with a Mona Lisa smiling at you. Ties with motifs are available for all tastes ranging from trash to art. As opposed to all over ties, the neckties with a motif on them are usually dominated by one huge single image that is not repeated. 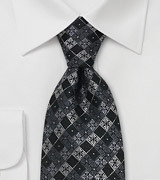 Anyone who likes this kind of tie should choose it carefully. A gigantic cactus in garish green is definitely fun, in business it would rather provide for sceptical looks. As for fantasy patterns, the designer can really rage himself out – floral, organic, floating, small or huge. 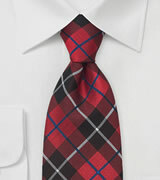 Thus, the term “designer tie” has a negative connotation amongst friends of the classic wardrobe. Not without good reason, because that is what some designers want most: to cause a stir with his design. But that is just what the conservative tie wearer wants to avoid. Office: Not in conservative professional fields. Office: Yes, but only “quiet” Tartans, e.g. Blackwatch. Fancy dinner: Yes, could be in stronger colors. Good weekend-look: Yes, best in earthy natural tones. Ties with Prince-of-Wales-Check (Glen check), hound’s tooth check, shepherd’s check and Co.
What is sauce for the suit is sauce for the tie. Thus, we find many sports jacket designs also on ties, often as Jacquard. Since most of them are quite fidgety, they are mainly suitable for solid colored shirts and ample patterned suit fabrics. A classic example would be the silvery-gray Prince-of-Wales-Check tie combined with a white shirt and dark grayish worsted yarn fabrics and pinstripes. Office: With blue, claret or silvery-gray background and small patterns. Fancy dinner: Yes, in similar colors as for the office. Festivity during the day: Yes, e.g. a fine Prince-of-Wales-Check or a shiny hound´s tooth check. 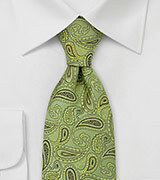 Good weekend-look: Yes, but on brown or green background with larger patterns.